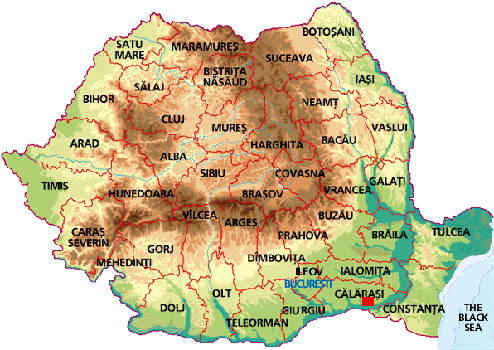 Capital: Bucharest municipality (divided into 6 administrative districts) with a population of 2,032,000. Situated in the south of the country, in the Romanian Plain (alt 85 m), the city dates from the 14th century and is recorded in writing for the first time in 1459 as residence of Prince Vlad Tepes. Administrative division: 41 counties (judeţe) and Bucharest municipality. Călăraşi, the capital of Călăraşi County and Sud-Muntenia, is situated in south-east Romania, on the bank of Danube's Borcea branch, at about 12 kilometers from the Bulgarian border and 125 kilometers from Bucharest. In 2007, Călăraşi had a population of 70039 inhabitants. The climate is temperate continental with cold winters and hot summers. The average annual temperature is 11.3 ° C.
The city is an industrial center for lumber and paper, food processing, glass manufacturing, textiles and heavy industry.